The England star was handed the club captaincy in the summer and insists his game has progressed. Rooney has scored two goals so far this season. MANCHESTER UNITED CAPTAIN Wayne Rooney has admitted that he is the not the player he once was, despite scoring two goals for the club so far this season. Rooney was handed the club captaincy in the summer but has struggled to lead the line for the club, with United winning just one of their opening five Premier League fixtures in 2014-15. And the England international has now admitted that he has declined in recent years and is unsure of his best position at United, with the loan signing of Radamel Falcao from Monaco casting doubt on his future as a main striker. 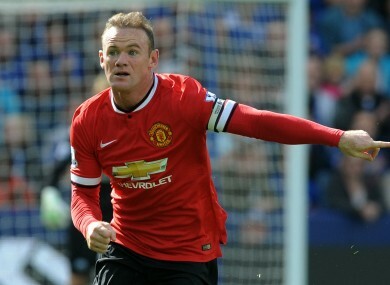 “I’m not the player I was,” Rooney said. “But I feel I have progressed my game. I agree with the people who say my game has changed. “I did too much running when I was younger and then didn’t have the energy to get myself into goal-scoring positions in the box. “I’m a cleverer [sic] player now and know when to run into the box and when not to, and as a result more chances have come my way and I’ve scored a lot more goals for the club. “But I am happy to play out wide. I can do a job there and I can do a job up front. It depends on the situation of each game and what the manager wants me to do. Email “Wayne Rooney: I'm not the player I used to be”. Feedback on “Wayne Rooney: I'm not the player I used to be”.